First guidebook with detailed multi-day bike tours of Washington state to come out in over a decade. Get your copy now to help you plan your next bike vacation, whether you’re looking for a beginner bike tour or a challenging ride over the roof of Washington. 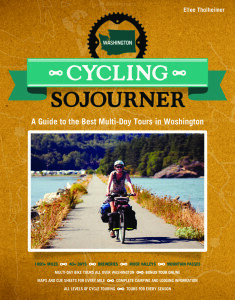 Order your copy of Cycling Sojourner by contacting us at 206.522.3222. Many thanks to our backers on Kickstarter and to Gold Wheel sponsor Red Lion Hotels for helping make this book possible, and to author Ellee Thalheimer for bringing this project to us as a way of growing bicycling and supporting our bike advocacy mission through sales and royalties. This guidebook provides high-quality, in-depth coverage for riders with all budgets and all levels of cycle touring experience. Cycling Sojourner Washington takes care of the logistics and leaves the world-class bicycling to you! Best places to experience local food, wine, beer, coffee, milkshakes . . . cycle tourists are fueled by calories! Escape from Seattle: Riding the John Wayne Trail: Bring your gravel bike for this one. Towns (not many, and that’s the point): Seattle, Issaquah, Fall City, North Bend, Easton, Cle Elum, Ellensburg. San Juan Islands: Discovering Cascadia’s Archipelago. Towns: Anacortes; Friday Harbor and Roche Harbor on San Juan Island; Lopez Village on Lopez Island; Orcas, Olga, East Sound, Doe Bay, Deer Harbor, and West Sound on Orcas Island; and Guemes Island. The Olympic Peninsula: America’s Rugged Northwest Corner. Towns: Port Angeles, Forks, Quinault, Montesano, Elma, McCleary, Olympia. Epic Washington: North Cascades Highway to the Methow Valley (traversing part of US Bicycle Route System 10). Towns: Mount Vernon, Concrete, Rockport, Marblemount, Mazama, Winthrop, Twisp, Carlton, Methow, Pateros, Chelan, Entiat, Wenatchee. Walla Walla Ramble: Wine Tasting to Seas of Wheat. Towns: Walla Walla, Waitsburg, Dayton. Pedaling the Palouse. Towns: Pullman, Clarkston, Asotin, Uniontown, Colton, Albion, Colfax, Palouse. The Okanogan: Overlooked Northern Reaches: Towns: Tonasket, Loomis, Oroville, Chesaw, Curlew, Republic, Wauconda. Northeast Washington DIY: Towns will depend on you, now that the book has given you some advanced adventure-planning skills. Consider Spokane your base camp. You might take in Davenport, Lake Roosevelt National Recreation Area, Kettle Falls, and Republic. Ellee Thalheimer, author of Cycling Sojourner: A Guide to the Best Multi-Day Bike Tours in Oregon and Hop in the Saddle: A Guide to Portland’s Craft Beer Scene, by Bike, among others, headed a team of experienced Washington bike writers and riders—Josh Cohen, Katherine Widing, Martina Brimmer, and Steve Krippner—to find the little-known bike travel treasures and the can’t-miss wonders. Have fun and do good: Royalties from Cycling Sojourner Washington will benefit the work of Washington Bikes. As we map the US Bicycle Route System, go to bat for more bike facilities funding in Olympia and Washington, DC, and collaborate with communities across the state to promote what great destinations they are for bike tourism, we’re working to make bicycling better every day for every Washingtonian. Intimidated by Bicycle Touring? Don’t Be! WHO CAN DO A BICYCLE TOUR? If you can ride a bike of some sort, you can do a bicycle tour. You don’t have to go fast. Actually, if you plan it right, you can tootle as slow as you please. For me, bicycle touring is about experiencing the places through which I ride. That means stopping to check out historical markers or an awesome mountain view. The weight requires more work, of course. But who cares? You have all day (and hopefully very low gears). There will be pedal-mashers who love to grind out a tour and reach optimal heart rates. That’s dandy, too. But touring is for anyone. Why Plan Your Bicycle Tour in Washington State? From purple mountain’d majesties to amber waves of grain, spacious skies and fruited plains–to say nothing of islands and ocean beaches, temperate rain forests, the thigh-burning climb to mountain passes and the glorious coast down, and rolling hills through lush vineyards–Washington state has every kind of scenic bicycling you could dream of. You could spend the rest of your life planning your bike tour vacations in the state of Washington. 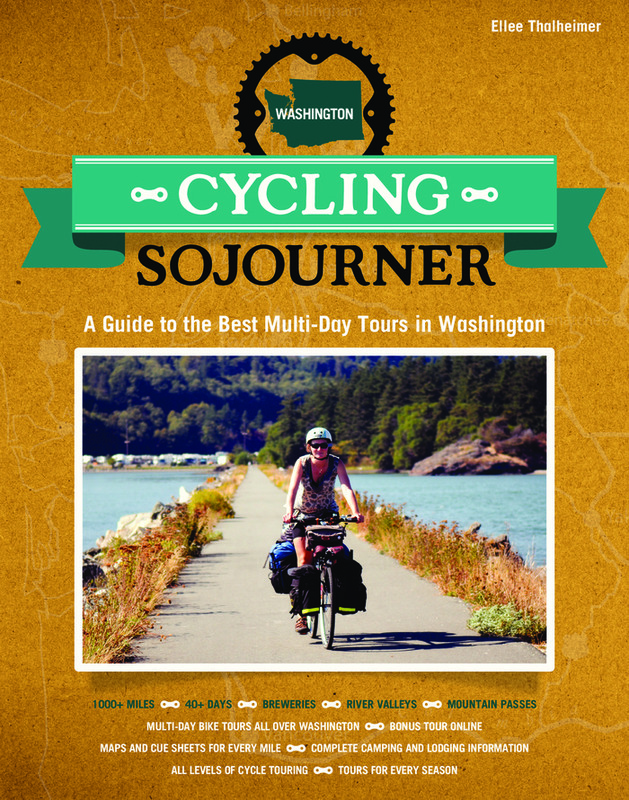 That’s where Cycling Sojourner: A Guide to the Best Multi-Day Bike Tours in Washington comes in. Your handy-dandy turn-by-turn guide, this book will give you the where, the why, the how-to, and the don’t-miss of unforgettable bicycle touring in the #1 Bicycle Friendly State in America.